Luis Suárez Miramontes (Spanish pronunciation: [ˈlwis ˈswaɾeθ miɾaˈmontes]; born 2 May 1935), also known by the diminutive Luisito, is a Spanish former footballer and manager. He played as a midfielder for Deportivo de La Coruña, CD España Industrial, FC Barcelona, Inter Milan, Sampdoria and Spain. Suárez is regarded as one of Spain's greatest players; he was noted for his elegant, fluid, graceful style of play. Nicknamed El Arquitecto (The Architect) he was noted for his perceptive passing and explosive shot and in 1960 he became the only Spanish-born player to be voted Ballon d'Or. In 1964 he helped Spain win the European Championship. Suarez originally achieved prominence as a creative inside forward or attacking midfielder for the great Barcelona team of the 1950s before he joined Inter Milan where he reached his prime as deep-lying playmaker for the legendary Grande Inter team of the 1960s. He played a pivotal role in the success of Herrera's Inter Milan side, and was one of the primary creative forces in the squad, due to his ball skills, vision, and passing range. He retired as a player in 1973, after three seasons at Sampdoria. He began his professional career with Deportivo de La Coruña in 1949 and worked his way through the junior sides before making his La Liga debut with Deportivo on 6 December 1953 in a 6–1 defeat to FC Barcelona. Among his teammates at Deportivo were Pahiño and Arsenio Iglesias. He played 17 games and scored 3 goals for Deportivo during the remaining season. In 1954 he transferred to CF Barcelona but spent most of the 1954–55 season playing for CD España Industrial in the Segunda División. In 1961 Suárez became the world's most expensive footballer and the first £100,000 transfer when FC Barcelona sold him to Inter Milan for 250 million Italian lire (£142,000). The move saw him follow his mentor Helenio Herrera. 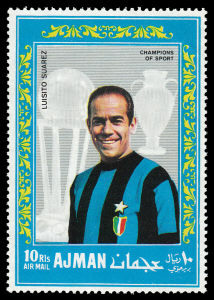 Suárez became a regular in the Grande Inter team that won three Serie A titles, two consecutive European Cups and two Intercontinental Cups. Between 1961 and 1970 he made 328 appearances for Inter and scored 55 goals. On 10 March 1963, he scored three times in a 6–0 win over Genoa C.F.C. ; this was the only hat-trick by a Spaniard in Serie A until Suso's for Genoa in 2016, to whom Suárez sent his congratulations. Suárez also played 32 games for Spain and scored 14 goals. He made his debut on 30 January 1957 in a 5–1 victory over the Netherlands and represented Spain at both the 1962 and 1966 World Cups. However his greatest achievement with Spain came in 1964 when, together with Josep Maria Fusté, Amancio Amaro, José Ángel Iribar and Jesús María Pereda, he helped them win the European Championship. He played his final game for Spain in 1972. ^ "Luis Suárez descubre una placa más "tocante" que el Balón de Oro". ^ "Great Team Tactics: Breaking Down Helenio Herrera's 'La Grande Inter'". Retrieved 15 September 2014. ^ "Luis Suárez: "Enhorabuena Suso, ahora estamos dos en el club"" [Luis Suárez: "Congratulations Suso, now we are in a two-person club"] (in Spanish). Marca. 4 April 2016. Retrieved 4 April 2016. ^ "EURO 1964 team of the tournament". UEFA. Retrieved 11 March 2016. ^ "Luis Suárez recibió el MARCA Leyenda – Marca.com". Marca.com (in Spanish). Retrieved 5 February 2017. Wikimedia Commons has media related to Luis Suárez Miramontes.